This isn't a book about time-hoping though, like one might expect (or at least, that was my initial thought) There is only one jump through time but despite that, there is a lot of talk of time travel, as well as dealing with the consequences of traveling through time. Since it's a middle-grade story, I felt there was adequate information here to make it plausible, without feeling as though the concept was being dumbed-down for a younger audience. I really appreciated that because I think it would have been easy to make things overly simple because of the target audience's age. Once Was A Time is a story about an incredible friendship between two young girls, Charlotte and Kitty. It is a truly beautiful friendship that survives many obstacles and tragedies. It warmed my heart to see how Charlotte and Kitty loved each other and how they would do anything for one another. I wish that more YA and adult novels focused on developing friendships like these! It's so much easier to accept characters going to any lengths for their beloved friends than for a boy they just met...but hey, maybe that's just me. I read this book in two sittings but could have easily done so in one, if life hadn't gotten in the way. I adored the references to classic books such as A Little Princess, A Monster Calls, The Book Thief and yes, even Harry Potter ♥ The main character Charlotte was sweet and resilient. The friends she made throughout time were assorted but the most memorable were obviously Kitty - but also Jake and Miss Timms. 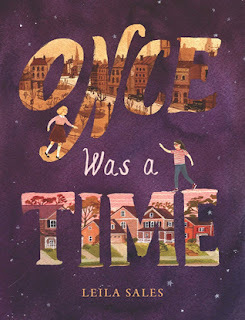 Once Was A Time was a lovely story about time-travel, love, loss and friendship that stands the test of time, as it were. The ending felt a little bit rushed though and throughout I found myself hoping for more time-travel, but that's just the geek in me taking over. The bottom line: this story is about friendships that last a lifetime. This sounds like a cute read and perfect for when you need something light and fun. Great review! This looks so adorable!! I'm normally not a fan of time-travel, but I bet in MG books it's just really cute. Great review!! It really was Lola^^ Oh and there's really not a lot of time-travel so I think you'd be ok with this one :) Thank you! So far, I've only been so-so about the Sales books I've read, but I do love time travel - might have to check this one out. Are you saying you needed to switch gears a bit after TRK and ACoMaF? XD Because I TOTALLY understand that, hehe! This sounds like it was very sweet. ♥ I'm with you, though; whenever I read a time-travel book, I expect quite a bit of actual time-travel, lol. I pretty much read for all age ranges - I like reading a good MG when I'm in the mood for a quick, light read :) This one definitely fit the bill :) Thanks Tracy! Ahhh, Leila Sales! She writes a bit of everything, doesn't she? I have not read any of her books but I believe I have seen some of her YA books floating around. Middle Grade isn't really my thing, but I love it when the stories show a great, powerful friendship and relationships. YA needs more strong, girl-power friendships! This was my first read by Sales but from what I hear, she does write a bit of everything! I love a good MG book from time to time, it makes a nice break from the romance and angst LOL! Honestly though, I read ALL age ranges :) Thanks Alyssa! I'm not one to read books for audiences that young. Some YA books just scrape through. I'm glad that you enjoyed it though. Sounds like the friendship between the girls was well built. Aww it sounds like a really good read. I'm with you, the importance of long-standing friendship needs to be represented well in books also. I'm glad this one was a good break. I read middle grade quite often and I am always looking for some good reads that Zane can enjoy as well. Thanks for the wonderful review!